Most super models are notoriously stereotyped as “un-eaters”, whether it is from dieting or starving, these beauties always get the heat. 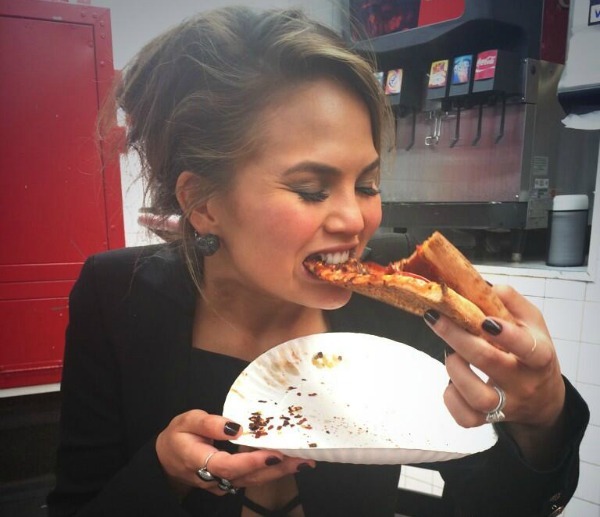 Sports Illustrated supermodel, and wife to John Legend, Chrissy Teigen is notorious for her love of good food. Her Instagram has no shortage of breakfast sandwiches and “stuff her mouth” selfies, and was chosen to be a judge for one of the countries top tier burger competitions, South Beach Wine and Food Fest‘s Burger Bash. This annual competition is a throw down for some of the most stomach bursting burger-coctions on the planet. If you have it in your pantry, one of these chefs are using it in their burger. Mac and Cheese, Fritos, Jalapeño Chips, Candied Jalapeño, and so much bacon. 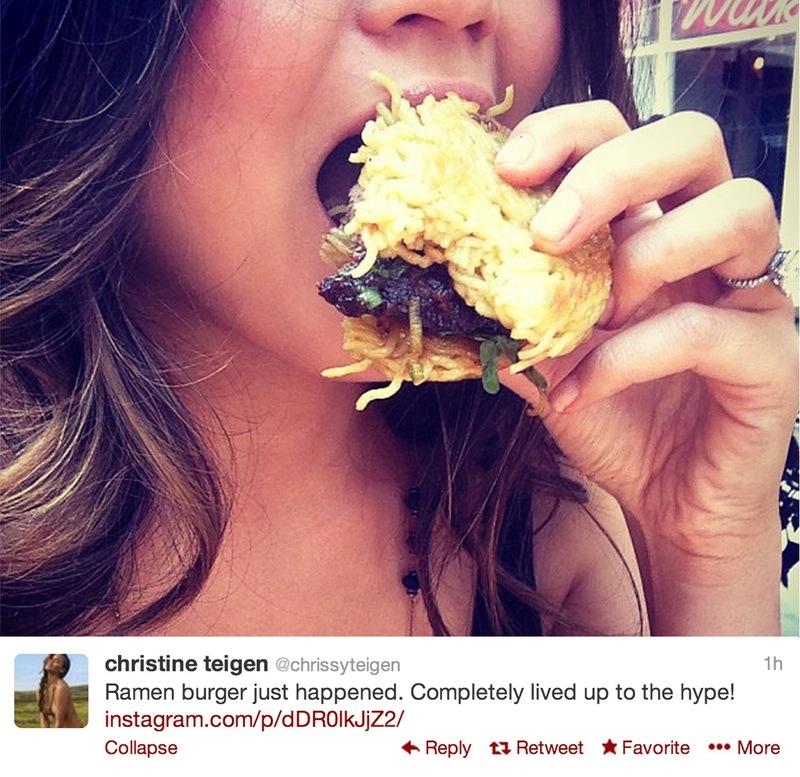 Chrissy Teigen and her judge comrades chose a burger out of Miami for “Very Best Burger”, Lure Fishbar‘s Bash Burger. 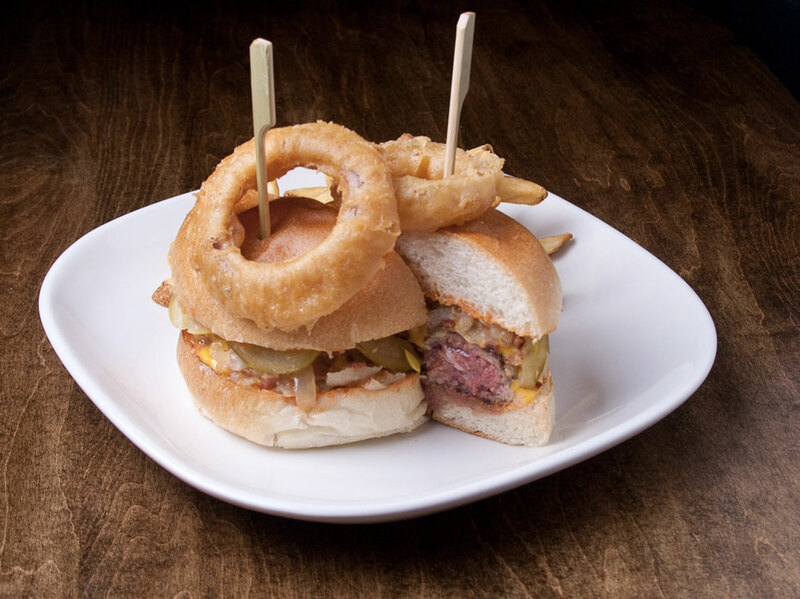 Josh Capon accepted the award for his creation, stuffing guests with a burger topped with American Cheese, loaded with secret sauce and caramelized onion bacon jam. Chrissy Teigen hit the field at Dodger Stadium in LA on Tuesday to throw out the ceremonial first pitch, and surprisingly, she nailed it! Despite drinking margaritas with her dad before the big event — she tweeted, “Crap, I’m pretty drunk,” before heading to the mound — Chrissy threw a nearly perfect pitch while also keeping things supersexy in a pair of blue short shorts and knee-high socks. In the days leading up to her big gig, Chrissy shared her practice plans via Twitter: “Making John [Legend] practice with me now. I have such a false confidence after 50 Cent,” referring to the rapper’s unfortunate pitch at a New York Mets game back in May. Although her husband wasn’t on hand to help her at the stadium, Chrissy did consult with Dodgers catcher Drew Butera before the pitch and ironed out her plans to jump into his arms after he caught the ball; like clockwork, after her flawless showing on the field, she posed for photos with Drew and had a sweet celebration with family and friends on the sidelines. Keep reading to see photos and video from Chrissy Teigen’s perfect first pitch. The first time we met Chrissy Teigen she was scarfing down chalupa stuffing at a Taco Bell Thanksgiving dinner (they exist). She’s one of the most charming, potty-mouthed people we’ve had the pleasure of meeting, well versed in both froufrou gourmet and fast food munchie talk. Foodbeast got the chance to catch up with her a few weeks ago, getting the word on her stint as a judge on Snack Off — think Iron Chef for Stoners — and the vilest thing she’s ever put in her mouth. If Nancy Grace came over for dinner, what would you cook her? That depends if she has any allergies, because I would cook all of those foods. Inside one fantastic pie. John Legend’s [her husband] most impressive dish? My personal favorite thing that John makes is his fried chicken. I bought him a deep fryer for each house, for each coast, because I needed him to make it whenever I need. He does an amazing mac n cheese. A little more intricate, three cheeses. It’s wonderful. People demand it every barbecue we have. I’ve actually never had Five Guys before. I think maybe I did in the DC airport. I don’t recall it because I was probably a little hungover. I’ve had In-N-Out so many times. I absolutely love In-N-Out but those fries kill me. The In-N-Out burger over any other burger, but I will take McDonald’s fries. Have you ever gone Monkey Style? Animal Style Fries stuffed in an In-N-Out Burger. Oh. My. God. That’s Bonkers Style. I’m a 100 percent down. 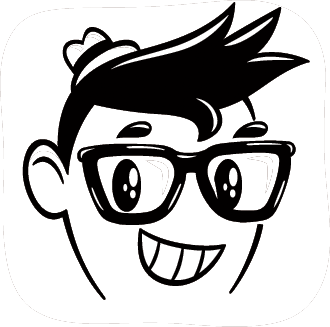 If you could run your own restaurant, what would you have on deck? I don’t think I’d ever own a restaurant really. I think that anyone that thinks that they can do it are usually the wrong people. I would love to open up a bed and breakfast. I would love to have a very small menu, with 3 apps, 5 main, and maybe 2 desserts and 1 special or something. I think all menus should be super limited, do they best you can with them, rather than those large menus. I would do my mom’s scalloped potato dish, a shepard’s pie or chicken pot pie. I love anything with a poached egg on it. So a salad with lardons, honey mustard vinegrette, with a poached egg. Tomato soup. I make the best tomato soup. Definitely a beautiful roasted chicken dish with seasonal vegetables. Fish and Chips with my dad’s famous tartar sauce. As you can see this menu has no clear vision. It’s a very classy b&b. Just throw on some truffle sauce and you’ll be fine… Do you watch Kitchen Nightmares? I’ve seen every single episode. What I don’t understand is why don’t they clean up if they know he’s coming and why are those mistakes so fixable? That being said: Guy Fieri or Gordon Ramsay? I would rather hang out and have a good time with Guy. I might want to go to a fancy restaurant with Gordon. I actually did go to his restaurant [Fieri’s] in NYC. We went in with every intention of making fun of it and we walked away tail-between-our legs. The food was excellent and the decor was hysterical. You have to take it for what it is and enjoy it. Most ridiculous thing you’ve judged on Snack Off? The most vile I’ve put in my mouth on the show was a smoked salmon tartar olive baguette topped with a red maraschino cherry. It was horrific. 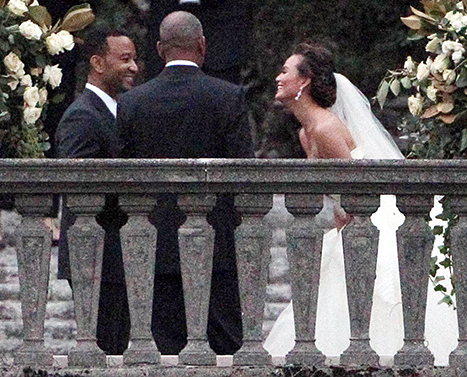 Chrissy Teigen and singer John Legend got married earlier today! The model/soon-to-be host of MTV’s “Snackdown,” and the Grammy-winning singer in an intimate wedding at Villa Pizzo in Lake Como, Italy. 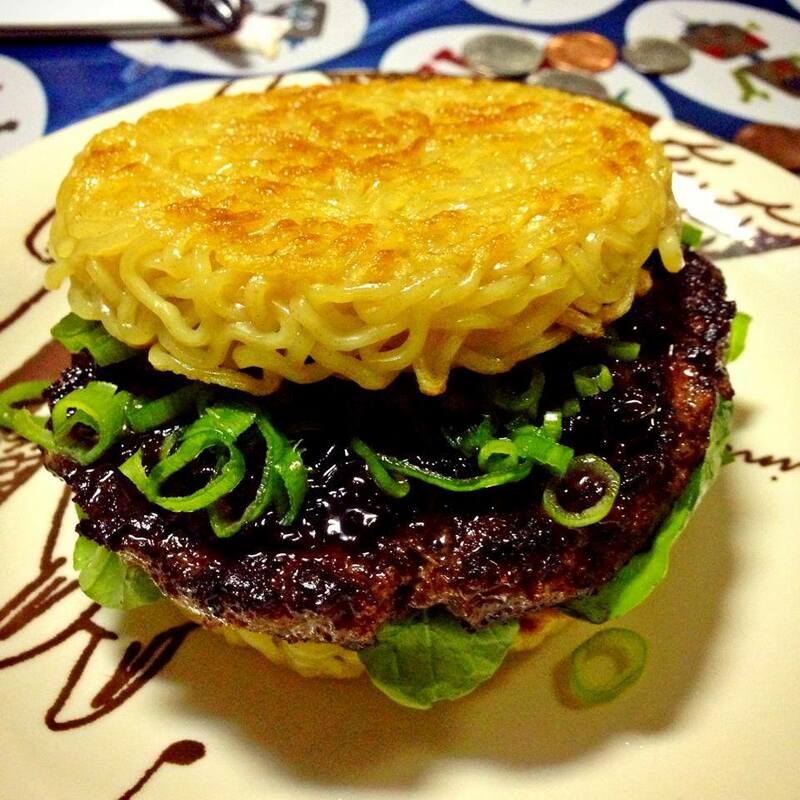 Ramen Burger: The latest food craze? The ramen burger is USDA prime beef burger stuffed between two buns made of fried ramen, topped with “secret” shoyu sauce, flavor-infused arugula and scallions. The burger, created by ramen enthusianst and blogger Keizo Shimamoto, 35, only made its debut at Brooklyn’s Smorgasburg food fair less than two weeks ago, but already foodies have been fighting to get a bite. The second generation Japanese American started a fairly popular blog among ramen circles, Go Ramen, and ultimately was able to quit his job as a computer programmer to move to Japan to study ramen with local chefs. While there, his passion for ramen was captured in a short film called “Ramen Dreams” that premiered at the 2012 NYC Food Film Festival in October that ended up winning Best Short. Just a two months ago, Shimamoto moved to New York to try his hand at selling his burger–and the very first time became an instant success –with a little help from some bloggers.